In U.S. practice, a poll tax was used as a de facto or implicit pre-condition of the exercise of the ability to vote. This tax emerged in some states of the United States in the late 19th century as part of the Jim Crow laws. After the ability to vote was extended to all races by the enactment of the Fifteenth Amendment, many Southern states enacted poll tax laws as a means of restricting black voters; such laws often included a grandfather clause, which allowed any adult male whose father or grandfather had voted in a specific year prior to the abolition of slavery to vote without paying the tax. These laws, along with unfairly implemented literacy tests and extra-legal intimidation, achieved the desired effect of disfranchising African-American and Native American voters, as well as poor whites. Though the 1958 Poll Tax Receipt is printed for 1958, you can see that the date 1959 was written on it. 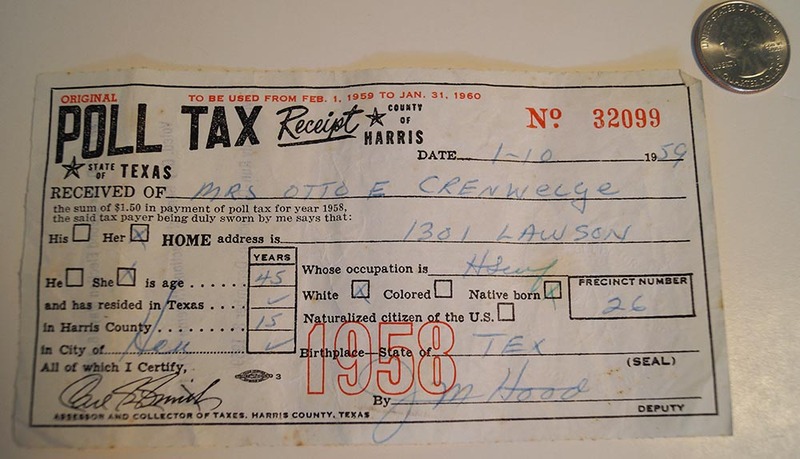 It was issued to Mrs. Otto E Crenwelge of Harris County, Texas. It is stamped on the back as having voted in Tax and Bond Election on May 16, 1959, City General Election, Nov 21, 1959, and City Run-off Election Dec 8, 1959. 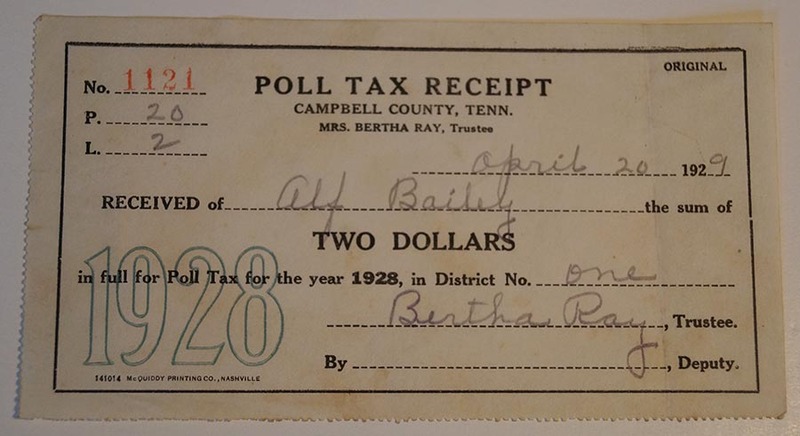 Though the 1928 Poll Tax Receipt is printed for 1928, you can see that the date 1929 was written on it. This was issued to “Alf Bailey”, a citizen of Campbell County Tennessee and cost $2.00 in 1928 (not a small amount in the 20’s). 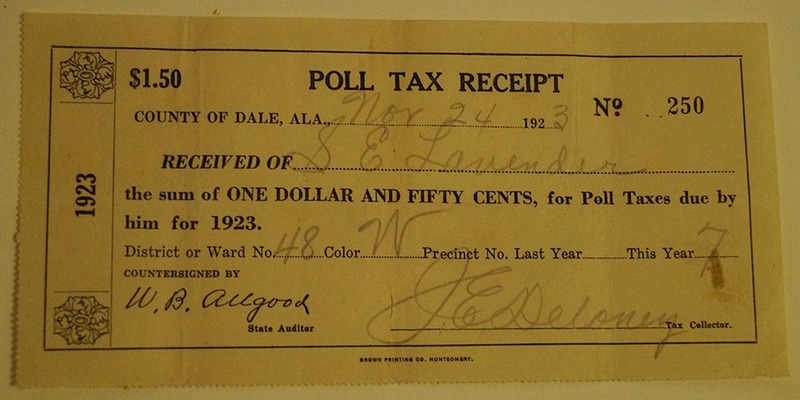 The 1923 Poll Tax Receipt is from Dale County, Alabama for S.E. Lavender.